Widely used in sleep labs, hospitals, and home care environments for more than 25 years Control III is a powerful, safe, effective disinfectant and germicide that is ideally suited for use on CPAP/BiPAP equipment. Control III will not cause drying or cracking of CPAP/BiPAP supplies and the concentrated formula makes Control III an extremely economical cleaning solution. 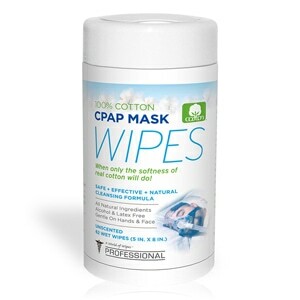 Powerful, Low Cost, Concentrated Cleanser: In addition to being one of the most powerful CPAP/BiPAP cleaning options on the market Control III is also one of the most economical. Each 16-ounce bottle is concentrated to make up to 16-gallons of cleaning solution. Just mix 1-ounce of Control III per gallon of water to create a non-critical disinfection solution that can be stored for up to 14-days. 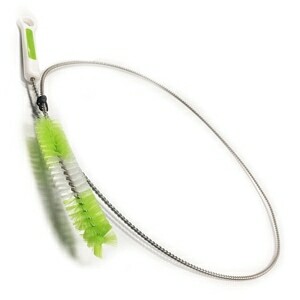 For CPAP/BiPAP users storage in a handy spray bottle is great for day to day disinfection. Really Strong! Effective Against Bacteria, Viruses and Fungi: Control III is a low-toxicity, benzyl ammonium chloride blend approved by the EPA. Control III has a mild, pleasant scent. With a ten minute contact time, Control III is effective against a broad spectrum of bacteria (gram-negative and gram-positive), viruses, and fungi. These include, but are not limited to, HIV-1, Herpes simplex, Adenovirus Type 2, Staphylococcus aureus, Pseudomonas, and E. coli, H1N1 (swine flu) virus, and MRSA. Control III Disinfectant germicide is a hospital grade disinfectant. It contains a special combination of two quaternary compounds, which makes it a highly effective, broad-spectrum disinfectant. By providing a hospital grade disinfectant for home care, you are assured of the same infection control at home that is available in hospitals. Mixed at a rate of 1 ounce to a gallon of water, a use solution of Control III Disinfectant can be created which can be used on a variety of hard surfaces and equipment. Is Control III Disinfectant germicide widely used for home care respiratory therapy and for sleep equipment? On a national basis, Control III Disinfectant has been used for over 25 years for the disinfection of home care respiratory therapy equipment. Does Control III Disinfectant Germicide harm the environment? Control III in use solution is environmentally friendly. When released into sewage or septic systems, Control III breaks down rapidly, without harm to human, animal, or plant life. The used solution can be disposed of down the drain and requires no special disposal procedures. Is Control III Disinfectant germicide irritating to the skin and eyes? Concentrated Control III Disinfectant, as it comes straight out of the bottle, is a primary skin and eye irritant. One should avoid contact with the concentrate on skin and in eyes. The diluted solution is not a skin irritant. If you do get it in your eye, you should rinse it thoroughly with plain water for 15 minutes. Call a doctor if redness or irritation persists. Does repeated use of Control III Disinfectant germicide harm equipment, or degrade the material? No. Control III does not contain drying chemicals that harm rubber, plastic, or metal. Furthermore, the use solution does not contain caustic or corrosive substances which harm equipment or cause irritation to the face if masks are disinfected with it. Is Control III use solution safe to use around children and/or pets? Yes. If the use solution is gotten on the skin, it should be rinsed with plain water. What types of pathogens are killed by Control III Disinfectant germicide? With a ten minute contact time, Control III is effective against a broad spectrum of bacteria (gram-negative and gram-positive), viruses, and fungi. These include, but are not limited to, HIV-1, Herpes simplex, Adenovirus Type 2, Staphylococcus aureus, Pseudomonas, and E. coli, H1N1 (swine flu) virus, and MRSA. Does Control III Disinfectant germicide kill spores? Control III Disinfectant does not kill spores; thorough pre-cleaning of surfaces prior to disinfection can contribute greatly to the reduction of spores on surfaces. Does Control III Disinfectant germicide kill Tuberculosis? Control III Disinfectant germicide does not kill TB. However, tuberculosis is not usually a threat in a home care setting. How can Control III Disinfectant kill bacteria if it is relatively non-toxic? Toxicity does not determine bactericidal effectiveness. Control III Disinfectant germicides mode of action attacks bacteria, viruses and fungi by a chemical process while maintaining a low overall toxicity level. I currently use vinegar and water to disinfect my equipment, as I hear it works just as well and is cheaper than Control III. Why should I start using Control III? Some patients have heard that vinegar is an alternative means of disinfecting equipment that is more natural and effective and cheaper than Control III. In fact, none is true. Vinegar is more of a household name than Control III. It is not more natural Control III also kills significantly more organisms than vinegar. Lastly, because of its concentrate form and its re-usability, it is actually 8 times cheaper than vinegar to use! Dont forget that Control III also has a much more pleasing odor. Should equipment be pre-cleaned before disinfecting? Proper pre-cleaning of equipment is the most important step in disinfecting your equipment, regardless of the brand of disinfectant you use. It removes the gross soil and bacterial spores which may have contaminated the equipment. After pre-cleaning, all equipment should be thoroughly rinsed with fresh water before being disinfected. What should be used to pre-clean the equipment? The equipment should be pre-cleaned with any general purpose detergent, such as a dishwashing soap like Joy, or Palmolive. Do not use bar soap however, as some of these soaps contain ingredients which are incompatible with Control III Disinfectant. A thorough rinse with clean water is essential. Regular tap water is fine  distilled water is not required. Do excessive heat or cold affect Control III Disinfectant? Excessive heat or cold will not harm Control III Disinfectant. If the concentrate has been subjected to extreme temperatures such as freezing, allow it to return to room temperature and shake vigorously. What type of container should be used for soaking? Food grade plastic containers, such as Tupperware or those made by Rubbermaid, are recommended for soaking. This is the type bucket we provide in our home care kit. We recommend keeping the use solution in an airtight container when not in use to reduce contamination and evaporation of the solution. Do not use a PVC container, as it may become tacky to the touch. How long does Control III Disinfectant last? 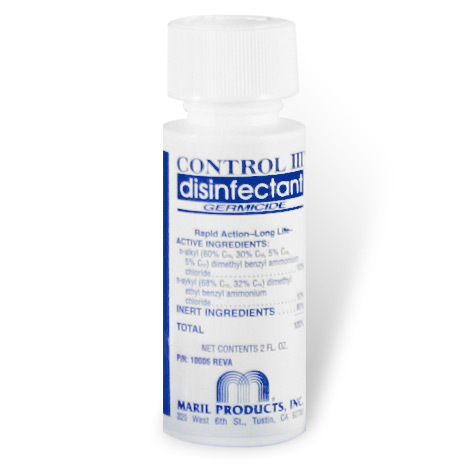 Control III Disinfectant, as a concentrate in its original container, has a shelf life of five years. Once a solution of Control III is made up (in a dilution of one ounce per gallon of water), it can be reused for up to 14 days before being discarded. Should the solution become visibly dirty prior to 14 days of use, or has been used extensively in the disinfecting of many pieces of equipment, it should be discarded, and a new solution prepared. What is the recommended soak time for Control III Disinfectant? Ten minutes is the soak time required by the EPA. Soak periods of more than ten minutes will not provide better disinfection. If disinfection of hard surfaces is desired, Control III solution should be applied in such a manner that the surface remains visibly wet for 10 minutes to achieve optimal results. Is a rinse required after disinfecting with Control III Disinfectant? Instructions for use call for rinsing of equipment after disinfecting. If you are not planning to use the equipment right away, we recommend that equipment be allowed to air dry after rinsing with Control III. Store the equipment in a closed container or in Ziplok� type bags. Please note that some PVC tubing or rubber parts may become tacky if they are not rinsed immediately after soaking.